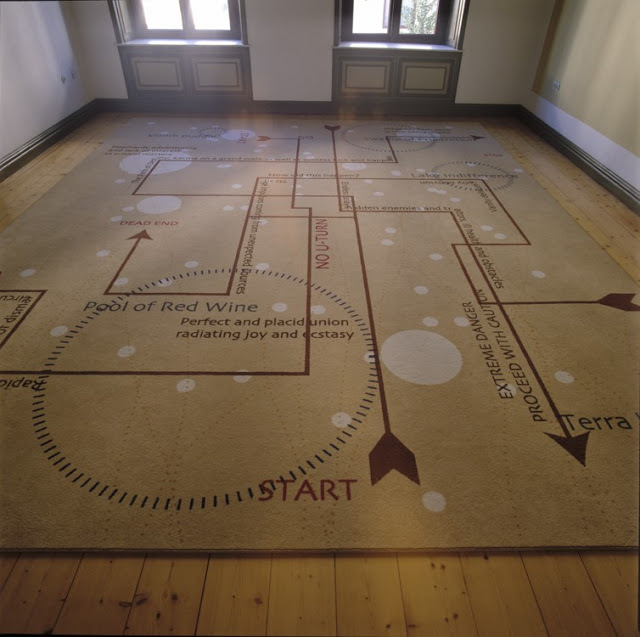 The carpet is part of a game, a confusing mapping of something that appears to be drawing from both external as well as an internal world. It refers to the Map of Tendre (Carte de Tendre or Carte du Tendre) was a French map of an imaginary land called Tendre produced by several hands (including Catherine de Rambouillet). It appeared as an engraving (attributed to François Chauveau) in the first part of Madeleine de Scudéry’s 1654-61 novel Clélie. The enormously popular and much imitated Carte de Tendre…became a symbol for the politically and culturally independent, aristocratic salonnières. From a later, feminist perspective, in this geography of sentiment the personal is indeed political… placing the female prerogative at the center of civilization by privileging ‘the private amorous contract contingent on woman’s inclination. However in Bonde’s mapping of this allegorical geography it much more confusing, who is being addressed and why is unclear. What kind of situation is the map trying to guide us through?